As one of the larger Greek islands, Rhodes offers everything from soft sandy beaches, crusader castles, frescoed churches, vibrant forests and lively nightlife. Its southern location in the Mediterranean Sea means that sunshine on this island is pretty much guaranteed throughout eight months every year. If you love water sports, then some of the most spectacular diving sites in Greece are found here, home to an abundance of marine life and shipwrecks. The island’s capital, Rhodes Town, is a UNESCO World Heritage site with history and Grecian culture teeming through its original surrounding walls. Lardos village offers a taste of traditional Greek life with the local population outnumbering tourists, enjoy a meal in the pretty village square from one of the award winning tavernas. The idyllic village of Pefkos is perfect for peaceful getaways and is also right next door to the islands gem, Lindos. The paved streets winding past the white house’s up to the ancient acropolis mesmerises visitors like no other town. Whether you want to relax on one of the famous, picturesque sandy bays or venture to one of the islands night-time venues and dance the night away you’ll be sure to find your ideal holiday in Rhodes. Located in the Eastern Aegean Sea, Rhodes forms the largest of the Dodecanese islands in terms of both land area and population. 200 miles east of mainland Greece, Rhodes is one of the most Southern Greek islands. With 137 miles of coastline embellished with beaches and mountainous, forested interiors, car hire is recommended in order explore the whole of this Mediterranean jewel. Drenched in sunshine almost all year round, you can rest assured that you’ll be most likely topping up your tan throughout your stay between the months of April and October. At the height of summer, Rhodes has around 13 hours of sunshine each day with an average temperature of 27oC in August and temperatures frequently soar into the thirties. Visit Rhodes in late Spring and early Autumn and take advantage of the slightly cooler temperatures by spending more time wandering around the islands cultural attractions with smaller crowds. Evenings in Rhodes Town mainly centre around Hippocrates Square where bars, tavernas and eateries surround an illuminated fountain in the shadow of the Palace of the Grand Master of the Knights of Rhodes. While Lindos and Pefkos are laid back and idyllic during the daytime, both towns liven up in the evening. Unwind in one of the bars watching the sunset after enjoying a traditional Greek feast or experience the ice bar in Lindos to really cool off. Lardos has some great bars centred around its main square, perfect for relaxing in after an evening meal. Due to Rhodes strategic position in the Aegean Sea, the island has come under many different occupations throughout history, reflected in the islands architecture. The ancient Greeks, Romans, Byzantines and the Ottomans have all left the imprint on here. The famous acropolis overlooking Lindos, the Hellenistic Temple of Apollo and the ancient stadium in Rhodes Town are all fascinating sites and evidence of Rhodes flamboyant past. Delve deeper into Medieval Rhodes Town with its cobbled streets, arched doorways and courtyards built by the famous Knights of St John. Rhodes rich history has given the island a unique cultural identity. Most of the island’s museums and castles are in Rhodes Town while there are many cloisters dotted around the island such as Tsambika Monastery and St. Pamteleimonas Church in Monolithos Castle. Visiting these holy monuments will give you an insight into Rhodes vibrant culture. Enjoy the sound and light show in the municipal garden that surrounds the walls of Rhodes Town which combines the dramatic architectural setting with evocative lighting to story tell. It’s no secret that Rhodes natural beauty and wealth of historical sites keep visitors returning year after year. Hiring out your own boat from Pefkos is a great way to explore the picturesque coastline all the way to Lardos and Kiotari. Visit Seven Springs, a natural beauty amongst pine forest, a peaceful place to shelter from the sun and spot tortoises, crabs and fish. Like everywhere in Greece, Rhodes is the ultimate foodie’s paradise. Local specialities include Souvlaki, Moussaka, Kleftiko, Gyros and Baklava with honey. Head high into the mountains where you’ll find Embonas, the centre of Rhodes grape-growing heartland. Spend an evening in the wineries here and sample the delicious yield. Don’t worry if you’re not feeling adventurous, there’s an array of international options too, catering for all tastes. Rhodes is perfectly equipped to make sure that your family holiday is a special one. Pefkos has a children’s water park with its own taxi service and a burger and beverage included in the ticket. Children will love butterfly valley which is loaded with a spectacular array of different colourful species during the summer months. Lardos beach is ideal for water sports enthusiasts from beginners to experts, cat sailing, water-skiing, parasailing, and windsurfing is catered for. 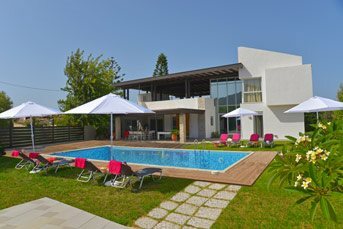 Here at Villa Plus, our customers are always at the forefront of our minds and we believe that our handpicked self-catering villas, in Rhodes, give you a choice that you’ll struggle to resist. Whether you fancy a spot of luxury in a peaceful countryside retreat, spectacular sea views at sunset, or a central location that means you can walk to restaurants and the beach, we have everything covered. As locals to the destination, we’re on hand 24-7 to ensure you have that perfect getaway that you’ve been dreaming of. We live and breathe the destination and want to ensure you leave Rhodes loving it just as much as we do. The East Coast of the island - home to all of our villas - is famous for its beaches including the rocky coves at Kalathos, the beautiful sands at Lindos and the sleepy Blue Flag beach at Pefkos. Lindos is one of the most beautiful villages on Rhodes, set on a hillside, with cobbled streets, whitewashed houses as well as stylish rooftop cafes, restaurants and bars. This chic resort comes to life at night! Take a walk or donkey-taxi to the Acropolis at the top and prepare to be wowed by the views! If you like your beaches and countryside natural and unspoilt, the traditional village of Kalathos will suit you very well. For a true taste of authentic Greece, the traditional village of Lardos is a great choice, white-washed houses clustered round the fountain. With its small but beautiful award-winning beach and excellent tavernas, Pefkos is perfect for a relaxing holiday, but is also next to Lindos where the action is. How will you choose between them? Don’t worry, whichever villa you chose, you can still see it all! Haraki is a charming small fishing village located on the East coast of Rhodes. The half moon bay with a pebbled beach has a great selection of tavernas, restaurants and bars on the seafront. From the top of the Castle Hill enjoy amazing views of the village. The sandy beach of Agathi and the delightful village of Lindos are just a 15 minute drive away. 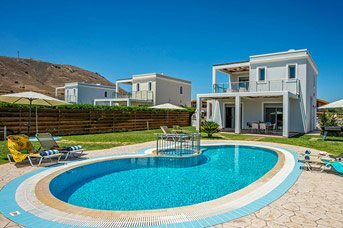 Set in a peaceful coastal location with the Mediterranean Sea to one side and rolling hills on the other, Kalthos is a scenic, peaceful destination. The beach spans Kalathos itself and has clear waters, perfect for snorkelling and scuba diving. There are several great seaside tavernas and Kalathos is well stocked to cater for all your holiday needs. The scenic town of Lindos is just a few minutes’ drive along the coast. Kolymbia is located on the East Coast, half way between Rhodes Town and Lindos. Sitting between the sea and mountains with a great beach for watersports, there is a laid-back vibe and a small selection of shops. A long tree lined avenue, dotted with cafes and tavernas, leads to the Blue Flag Beach. From this resort it’s easy to explore Rhodes by car or boat, and could even island hop to the picturesque island of Symi - don’t forget your camera! Receiving some of the best weather on this already sunshine soaked island, the small, friendly village of Lardos is a great holiday destination. Lardos attracts locals and tourists alike thanks to its stunning scenery so a holiday here is sure to give you a real taste of Greece. This scenic resort is perfect for a relaxing holiday and Lindos is a short drive down the road with a large selection of shops and tavernas as well the famous acropolis. A jewel in Rhodes’ crown, Lindos is quite possibly the prettiest resort on the island. The picture postcard streets lined with white-hued buildings give you a real sense of what life was like on the island a hundred years ago. Home to Rhodes’ most famous monument, the ancient acropolis, there are is no shortage of cultural attractions in Lindos. Plenty of bars and restaurants give the town a buzz and with two scenic sandy beaches, it’s easy to understand why Lindos has become the island’s premier resort. With its golden sandy beaches sloping gently into the Aegean Sea and laid-back friendly atmosphere, it’s easy to see why the beautiful village of Pefkos is such a popular holiday destination. Pefkos slow-paced way of life gives this resort a relaxed ambience but is also nearby the livelier resorts of Lindos and Lardos. Home to a variety of tavernas, shops and eateries, there is plenty to eat, sea and do in Pefkos. Located in the north of the island, Rhodes Town has two distinct faces. This magnificent medieval town is the cultural hub of Rhodes, with its cobbled alleyways and historic touches wherever you look. You’re best exploring this captivating place on foot, exploring the delights within the walls. By contrast, the new town is a bustling haven of shops with bars and restaurants on every corner where you can enjoy a quick pick me up or relaxing meal. Rhodes Town is also a great location for windsurfers, thanks to the Aegean breeze making plenty of waves. The natural beauty of Rhodes and the historical sites makes this Greek Island a popular holiday destination for all types of holiday makers, from family beach holidays to fun-seeking groups. The appropriately named 'sun island' or 'island of light' offers year-round sunshine and activities. The spectacular landscapes and ancient towns of Lindos, Pefkos and Lardos are the national treasures of Greece, whilst offering quaint little shops and restaurants to suit a variety of tastes. If you want to explore Rhodes independently, why not pack a picnic and be the skipper of your own boat? For example, Pefkos is all about boats, and you can hire quite a variety of vessels there. You can hire a boat big enough for six, complete with full safety gear and life jackets. The boatman shows you what to do then off you go! You don’t need a driving licence, and will be given all the help you need, even if you have no boating experience. Thisis a brilliant way to explore the beautiful coastline all the way to Lardos and Kiotari and escape the crowds! If fishing has you hooked, you can hire a boat fully equipped with fishing rods and bait, and start preparing your story about the one that got away! Eating out is likely to be one of the main pleasures of your holiday in Rhodes. Head for one of the long-serving, classic Greek tavernas - excellent, inexpensive, traditional restaurants where you will be warmly welcomed. Try home-cooked local dishes such as lamb kleftiko, moussaka or stifado, made from recipes handed down over generations or snack on warm cheese or spinach pies or some sweet baklava dripping in honey. If you want more choice, anevening out in Lindos or Rhodes Town will deliver anything from five course gourmet dining in great style to bangers and mash, pizza or Rogan Josh. Wherever you are on the island, it is worth a day trip by car, bus or boat to Rhodes Town, a UNESCO World Heritage Site and one of Europe’s most impressive surviving walled towns. In the magnificently well-preserved old town, with its cobbled streets, arched doorways and courtyards, is a medieval citadel, built by the famous Knights of St John. Before Suleiman the Magnificent turfed them out in 1521, the Knights ruled Rhodes for more than two centuries,and left their mark in no uncertain terms. The so-called Street of the Knights is one of the best-preserved medieval monuments in the world. The most splendid Ottoman relic is the Mosque of Suleiman with its many domes and minarets. The vibrant new town of Rhodes is great for a night out with hundreds of bars, discos, nightclubs and tavernas. Also, don’t miss Mandraki Harbour with its marina full of luxury yachts from all over the world. There are many fine beaches on the island offering water sports, and some of the most spectacular diving in Greece happens here. The Blue Flag beach at Lardos, shelving gently into turquoise waters, is a brilliant spot for diving and snorkelling. On Lardos Beach beginners can learn catsailing, water-skiing, parasailing, paragliding, and windsurfing with qualified and experienced English-speaking instructors. Kiotari also has its own water sports centresand at Vlicha Beach you can choose from a number of water sports including banana boats and snorkelling. Lee Beach has a range of water sports on offer including kite-surfing, windsurfing and jet-skis as well as the usual pedalos. For serious windsurfing head south to Prassonissi, which is considered one of the best windsurfing spots in the Greek Islands. Rhodes has many great sandy beaches stretching across the island. On the South Eastern side you will find Kallithea, Afandou, Tsambika, Vlycha, Lindos, Lardos and Gennadi. On the North Western side from the town of Rhodes there are the resorts of Ixia, Mandriko and Skala Kameirou all of which have large beaches. If sandy beaches are what you like then you have come to the right place, Rhodes is known for having the best beaches in the Mediterranean. From swimming the clear blue sea to a relaxing time in the sand, Rhodes has it all! Elli Beach is in Rhodes town at the northern tip of the island located between the area of Mandraki the Rhodes aquarium. The beach is a mix of sand and pebbles, out to sea is a five-metre high diving platform from where amazing dives into the turquoise sea are performed. Along the beach-front there are parking spaces and sea front restaurants. Sunbeds and umbrellas are available to hire. The best time to visit is early morning or late afternoon. Glystra Beach is the next bay along from Lardos. A sheltered bay, backed by Pine Trees and Olive groves. Beautiful fine sand and shallow waters make it ideal for snorkelling and is perfect for families with children. Sunbeds, umbrellas and peddle boats are available to hire. A family run canteen providing snacks and drinks is just to the back of the beach. The perfect choice for lazy days on the sand! A long stretch of sand and pebble with clear shallow waters, the sheer size of this bay means it doesn’t feel crowded. Several sections of the Afandou Beach have been awarded Blue Flag status and have sun loungers and parasols available for hire. There is no shortage of small restaurants and fish tavernas sat behind the sand here, meaning you’ll be well equipped for spending the day at Afandou Beach. Water sports enthusiasts are well catered for with beach sports centres located along the sand. Actor Anthony Quinn bought this secluded bay after filming The Guns of Navarone. The beach is considered one of Rhodes most beautiful bays – no mean feat on this Greek island. Made up of sand, pebbles and rocks in some places, the scenery here is spectacular. Sunbeds and parasols are available for hire here and there is a restaurant on hand ready to provide you with refreshments. The emerald water owes its colour to the lush scenery that surrounds the bay and the crystal clear waters make this a great snorkelling spot. Situated along the sleepy fishing village, Haraki Beach is a half moon bay perfect for lazy days by the sea. The mix of sand and shingle has sun loungers and parasols available for hire. Several restaurants flank along the beach promenade selling freshly caught fish – the perfect place to unwind in the evenings and watch the sun drop below the horizon. If you swim across to one end of the beach you will have a great view of Frekalos Castle. Kalathos Beach a 20 minute walk from the village. Rarely crowded, this beautiful tranquil beach is some 2 ½ miles long with a mixture of sand, fine shingle and pebbles. A long the shore are a couple of restaurants and a canteen. Sunbeds and umbrellas are available to hire or if you prefer you can find your own private secluded spot. With clear blue waters and soft golden sand, it’s no wonder that Kiotari Beach has become such a popular place to holiday. Visitors are well catered for thanks to the luxury hotels that overlook the beach. There are many tavernas and restaurants along the beach front serving all kinds of delicious refreshments throughout the day. There are numerous shops selling handmade trinkets and souvenirs, perfect for taking back home as gifts. A picturesque bay with dramatic rocky coastline either side, Ladiko Beach is a hidden strip of sand and pebble. Sunbeds are available for hire along this beach and even on some of the rocky sections, where they are allowed. The best time to visit is during the morning when sun shines directly onto this stretch of coastline. Visitors are well catered for thanks to a small taverna supplying daily basics. An interesting fact about this bay is that the nearby cliffs were used in the filming of ‘The Guns of Navarone’. The Blue Flag beach of Lardos is one of the main reasons why visitors keep returning to this fantastic resort. A mixture of sand and shingle that gently shelves into the waters, this bay is popular for diving, water sports and snorkelling and extends all the way to Lotharika. If you’d rather kick-back and relax, Grab a snack or an iced coffee from one of the many beach tavernas enjoy the scenery. Another one of Rhodes many Blue Flag beaches, Lee Beach is a fine sandy bay which gradually slopes gently into the sea. Ideal for swimming and sun bathing, there are plenty of sun beds and parasols for hire as well as restaurants, snack bars and shops on hand. Lee Beach is great for a variety of water sports and boat hire is available from here meaning you can explore more of this pristine coastline. Lindos popularity is partly thanks to its pristine beaches. Both bays have fine golden sand and clear shallow waters with sunbeds and changing facilities. Enjoy a spot of lunch at one of the hotels along the beaches or watch the sunset with a glass of wine in the evening. You can easily walk down to the beach, however, the ascent back up towards the town may be too steep for some beachgoers. Luxury hotels line Navarone Bay thanks to its secluded and exclusive feel. This beaches beauty means that it is a popular stop-off point for cruises exploring this section of coastline. The bay was the setting for the film ‘The Guns of Navarone Bay’ – see for yourself why this beach is iconic of Rhodes. Turqoise waters meet dramatic rocky cliffs providing some of the best scenery on this already spectacular island. Pallas Beach sits in a deep sweeping cove, just South of Lindos. Walk down to the beach through a great selection of places to eat and drink. On the beach itself you’ll find sun loungers, parasol, peddle boats and canoes. A family favourite, this beach has soft golden sand with calm shallow waters. A must for water sports enthusiasts, Prassonissi Beach is perfect for windsurfing and kitesurfing thanks to the constant wind it receives all year round. A truly unique setting at the southern tip of the island, this strip of sand connects Rhodes to Prassonissi. You’ll be sure to find a section of this beach that you can claim all for yourself as this vast expanse of sand stretches for a whole kilometre from north to south. 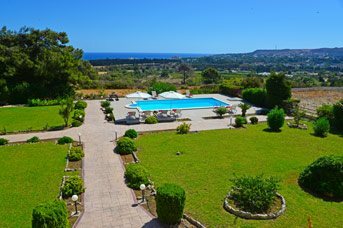 A great place for a day trip with plenty of tavernas and restaurants providing refreshments all day. The picture-perfect St Pauls Bay is a must-see destination for anyone visiting Rhodes. With its deep blue water, rocky cliffs and sandy beach, this natural bay captures Rhodes pristine beauty and is iconic to the island. There are sun loungers on the sand – perfect for kicking back in this Aegean oasis. The crystal-clear waters and rocky topography make this beach a great place for snorkelling. A family favourite, Stegna Beach is a great mixture of sand and pebble dipping into gently sloping crystal-clear waters. Located near Archangelos, the beach is well equipped with tavernas and shops meaning you be well looked after on this stretch of coast. If you’re looking for excitement, the waters sports centre is the best place to get you’re great racing and you can also hire boats from here. A long broad stretch of fine golden sand, Tsambika Beach offers something for everyone. With a water sports centre and various eateries and bars dotted along this long stretch of sand plenty of sun loungers and parasols – what more could you want? At the north end of the beach at the top of a cliff overlooking the bay is the church of Panagia Tsambika. Sets of stairs will get you up to the shrine where there are spectacular views across this stretch of coastline. This idyllic sandy beach is the perfect place to unwind in Rhodes. This bay has sun loungers, parasols a water sports centre and a beach bar – everything you could possibly need to enhance your island experience. Hotels and self-catering apartments add to this beaches list of catering amenities. With calm, clear waters, this beach is a great choice for those who want to be near Lindos but away from all the hustle and bustle. Perfect for swimming, snorkelling and sunbathing, St Thomas Beach is a sandy haven for holiday makers. Watch the fishermen moor their boats in the bay and bring in the daily catch. With rock pools at one end, kids will love the variety of marine life visible at this bay. Bring your own refreshments though as the secluded nature of this beach means there are no catering facilities. Drive or walk down to the beach, but be prepared to go back up the steep hill on the way back. Stretching along the coast from Pefkos towards Lardos, this fine sandy bay is great for soaking up the sun on one of the loungers available for hire. The calm clear waters are great for swimming and snorkellingand quickly deepen away from the shore. There is a beach bar serving refreshments meaning you’ll be well catered for throughout the day. If you’re lucky you might spot a Sea Lion in Fokia Bay. This remote Bay is perfect for people looking to relax on a pristine beach. The bay itself is mainly made up of pebbles and surrounded by rocky cliffs. The rocky structure of this bay means that a spectacular diversity of marine habitats are located here. Be prepared to bring refreshments as this secluded bay doesn’t have any facilities. On the Greek island of Rhodes, eating out is a social occasion, to be enjoyed with friends and family, especially in the summer months. As an island, you can expect a fair amount of fresh seafood such as octopus, sea bass and small shrimps from nearby Symi readily available and served in most tavernas. Greeks are the masters of charcoal. The famous Souvlaki, grilled meats wrapped in pitta bread with a lashing of tzatziki is hard to beat. They have perfected the meatier dishes using their favourite herbs and mixed spices which are prepared early in the morning and slow cooked to perfection. For weekend fruit and vegetables, the market in Zefiros (just outside Rhodes Town) runs from 7am to 2pm on a Saturday morning and you will find it just before you get to the new marina. 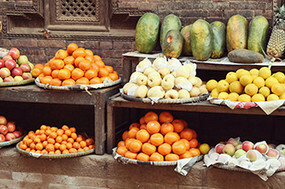 You will also find pop up stalls on the outer skirts of the resorts offering homemade produce such as olive oil and thyme honey as well as fresh seasonal fruits. Local fisherman set sail, well before the sun rises! So expect to find lots of fresh fish in the nearby village of Lardos. Greek food is something that's to be enjoyed throughout the entire day, and as such, the Greek culinary styles vary from larger, fuller meals to see you through the slightly cooler evenings to traditional Greek salads, tzatziki dips and mezze plates to fill you up during the day. There are plenty of in-between dishes too, with dolmades (stuffed vine leaves) and saganaki cheese (see below for recipe) as well as fresh pitta breads accompanying much of the cuisine. Kleftico – a rich lamb dish that's slow-cooked with wine, gravy and shallots, and usually served with roast potatoes or mash. Feta sti Shara – grilled feta cheese that's topped with tomatoes, seasoned with pepper and oregano and briefly baked in foil. Psari Ahnisto – fresh grouper fish that's steamed with lemon juice, oregano and olive oil. Greek food is so delicious, there's no reason why you can't treat your palette to a taste of it before you leave home, or continue enjoying it once you return from your trip! With that in mind, a lovely, simple starter is the aforementioned saganaki cheese. This speciality cheese is grilled and tastes best served with a squeeze of lemon and crispy, toasted pitta breads - perfect as a starter! 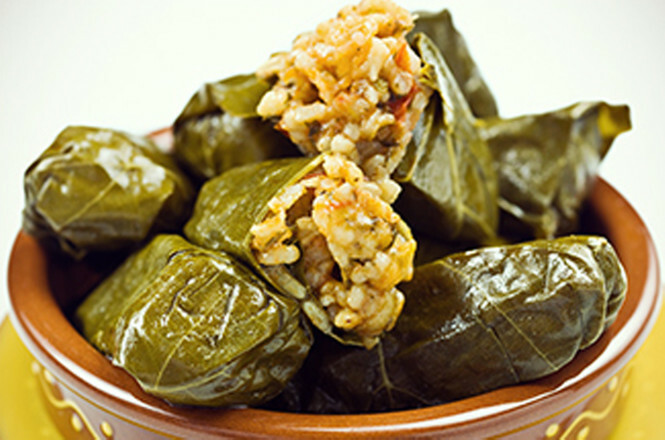 For a tasty main course, be sure to whip up some dolmades. 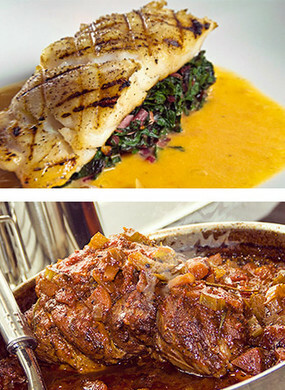 Served with rice or roast potatoes and a sauce of your choice, they make for a delicious meal! Firstly, cut the cheese into rectangular strips, making sure they’re wider than they are thick. Next, you need to flour the cheese. To do this, take each strip and run it under the cold tap and coat lightly with the flour. Once you're happy you've coated each of the strips, heat the oil in a frying pan or the more traditional saganaki pan, and fry the cheese until all the strips are golden brown on both sides. 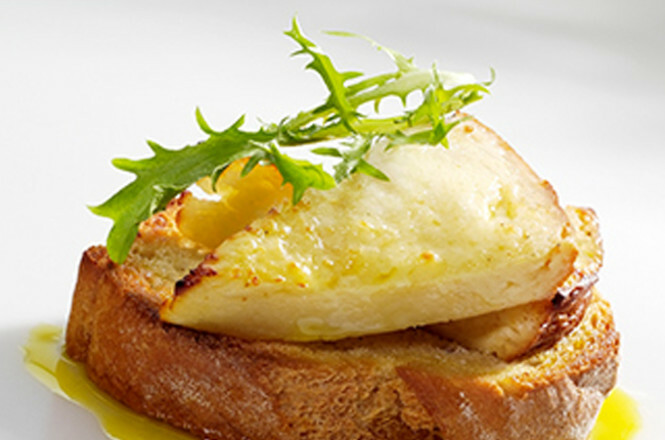 Lightly drain as you lift the cheese from the pan, and serve promptly with the lemon and toasted pitta breads. After preheating your oven to 180°C, make the filling by combining the rice, meat, herbs, onion, celery and a pinch of salt and pepper, and then fold in the tomato puree. Carefully placing one vine leaf on the plate, fill the leaf with some of the mixture in the centre near the leaf's stem, and fold both sides of the leaf into the middle over the filling before rolling it into the desired cylindrical shape. Repeat until all your mixture is used! Place your chopped tomato slices on the bottom of an oven proof dish, and place your filled vine leaves on top. Push the garlic slices between the dolamdes, and sprinkle with lemon juice before adding 150ml of cold water and covering with foil. Bake for 45 minutes, and add extra water if necessary.